Speaking at an event organised by the Mumbai Press Club, the Supreme Court lawyer said if the Central Bureau of Investigation (CBI) failed to follow due process and register a preliminary enquiry (PE) or an FIR, he will take the case to the court. 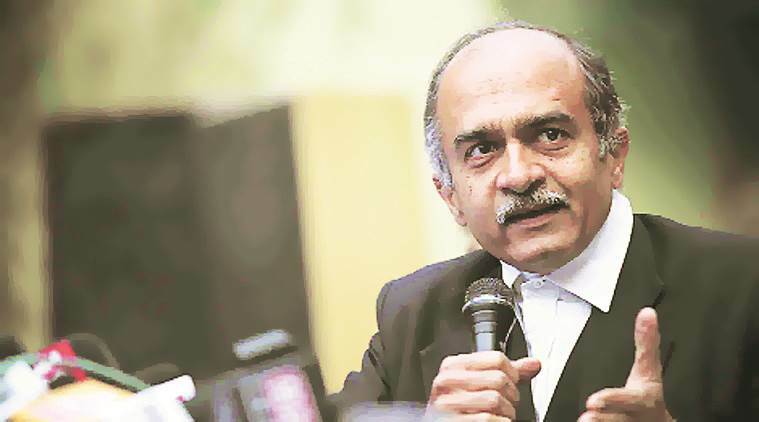 Calling Rafale deal the “largest defence scam that the country has seen”, Lawyer and activist Prashant Bhushan Saturday hoped the CBI would act on the complaint made by him and two others against Prime Minister Narendra Modi in the matter. Speaking at an event organised by the Mumbai Press Club, the Supreme Court lawyer said if the Central Bureau of Investigation (CBI) failed to follow due process and register a preliminary enquiry (PE) or an FIR, he will take the case to the court. A PE is the first step of a probe by the CBI where the agency assesses whether the allegations have enough material for registering an FIR. The Rs 58,000-crore Rafale fighter jet deal has been at the centre of a raging political row with the Congress accusing the Bharatiya Janata Party (BJP)-led National Democratic Alliance (NDA) government of wrongdoing. The government has rejected all allegations. Responding to questions on whether the Rafale deal was similar to the Bofors scam of the 1980s, he said the present defence agreement with France was a much more serious and greater cause of concern. “This (the Rafale deal) isn’t merely a matter of securing commission for a particular company, as was the case in Bofors. This is the largest defence scam that the country has seen,” Bhushan said. “To begin with, it deals with much more money. It left the Indian Air Force high and dry, and by securing offset contracts for Anil Ambani’s new company that has no experience in building fighter aircraft, it also puts our national security at risk,” he said. On October 4, Bhushan, former BJP minister Yashwant Sinha and senior journalist Arun Shourie submitted a written complaint to the CBI over the Rafale deal. The complaint named Modi and former Defence Minister Manohar Parrikar. It urged the CBI to register a PE against them on various charges under the Prevention of Corruption Act for a range of alleged offences committed in April 2015 in the course of buying 36 Rafale jets from French firm Dassault Aviation. In the complaint, Bhushan and the others questioned how Ambani’s Reliance Defence, an Indian offset partner of Dassault, could be involved in the deal as it had no prior experience in the field and most other companies of the industrialist “were in debt”. “We are yet to hear from the CBI. If due process is followed, the CBI should register an FIR based on the complaint. However, if that doesn’t happen then we’ll take the matter to court,” Bhushan said. In September 2016, India signed an inter-governmental agreement with France to buy the jets, the delivery of which is slated to begin from September 2019. Bhushan alleged that while the government had refused to reveal the per plane rate, the deal was over priced and that the French firm had been made to chose Reliance Defence at the insistence of the prime minister. Bhushan said the initial plan was to get 126 aircrafts. While 30 per cent of these were to be made by Dassault, the rest were to be made here in India by the state-run Hindustan Aeronautics Ltd (HAL), he said. In his complaint, he has alleged that just months before the deal was finalised, the then Foreign Secretary, S Jaishankar, had said HAL would be involved in the process of getting the 126 aircrafts. “It is significant that Mr Modi chose to keep the IAF, HAL, the Foreign Ministry, and even the Defence Ministry in the dark about his impending designs,” the complaint reads. Last month, a French media outlet quoted former President Francois Hollande as saying his government “did not have a say” in choosing Reliance for the deal since the Indian government had proposed the private company’s name. However, both Dassault and the French government have denied any such imposition. Dassault has said it had freely chosen to partner with Reliance to fulfil its offset requirements as part of the deal. Ambani has already emphasised that the government had no role in Dassault picking up his company as a local partner. He had written to Congress president Rahul Gandhi on December 12, 2017, refuting allegations of his company lacking experience to bag the deal. Ambani had written that Reliance Defence, with the largest shipyard in the private sector at Pipavav in Gujarat, was currently building five Naval Offshore Patrol Vessels (NOPVs) for the Indian Navy and 14 Fast Patrol Vessels for the Indian Coast Guard. The Congress has been raising several questions about the deal, including on the rates, and has accused the Modi government of compromising national interest and security while causing a loss to the public exchequer.